Hon. (Mrs) Giwanson Mudirat Aramide is an ardent team player with a knack for organizational coordination and motivation, especially towards the advancement of the overall corporate goal. This explains her steady progression to the very pinnacle of the corporate ladder over a 30-year period culminating in her appointment, on October, 19th 2015 as Special Adviser to the Governor on Housing. Born on the 9th of December, 1965, her father hails from Itogbesa in the Ojo Local Government Area and her mother from Ajido in Badagry Local Government Area of Lagos State. The young Aramide had her primary education at St. Micheal Anglican Primary School, Ojo Lagos, between 1972 and 1978. She gained admission into Government Teachers’ College, Ajara Badagry, Lagos State in 1979 where she obtained her Grade II Certificate in 1984. She later attended the Lagos State College of Education now known as Adeniran Ogunsanya College of Education between 1991 and 1994, where she obtained her Nigeria Certificate in Education. 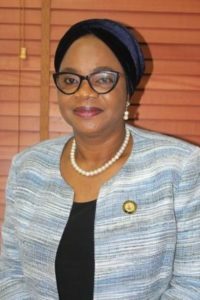 In furtherance to her academic prowess she attended Lagos State University, Ojo Lagos State from 1999 to 2003, where she obtained Bachelor of Education in Guidance and Counselling. As a lovely mother she is a naturally gifted problem solver, with series of skills, which gives her a high level of advantage in negotiating solutions delivery. She is married and blessed with two boys and two girls, a devout Muslim and a socialite.